Most anglers have fond memories of learning how to fish. Often taught by a father or grandfather, fishing is one of those rare pastimes that passes down from generation to generation, giving families the chance to bond and create lasting memories. For older anglers, learning to fish was quite a different prospect back then compared to how it is now, namely due to the incredible differences between modern and vintage tackle. While improvements in technology have certainly made the sport better for everyone, it’s hard to deny just how exciting it must have been for anglers then to use what we now call vintage fishing tackle. Yes, they were for the most part uncomplicated tools for simpler times. But hold an old fishing pole or lure in your hand and somehow you are transported, if only briefly, back through history to a time when the fishing – and life in general – seemed magical. Perhaps some of those fond old memories still persist in some of you. Rummaging through the old tackle box, choosing a lure from your father’s or grandfather’s collection of time-tested favorites, casting a line with a wooden cane rod – nothing quite compares to those childhood memories fishing with that special someone. But while most of us enjoy the thought of vintage fishing tackle as nothing more than nostalgic childhood memories or historic relics, there is still a thriving community of anglers and fishing tackle enthusiasts for whom they also remain very much a thing of the present. 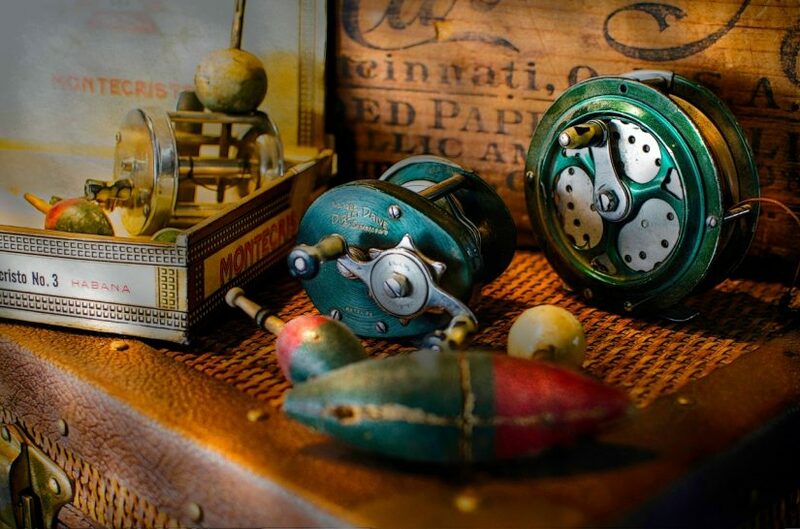 It’s not something mainstream sportfishing shines a light on, but the interest in and demand for vintage and antique fishing gear is bigger than most would imagine. From avid collectors searching garage sales and thrift shops for hidden gems to old-school anglers continuing to use vintage fly tackle on their fishing trips, older fishing equipment hasn’t quite been left in the past as many assume. In fact, vintage tackle is becoming an increasingly popular trend in fishing, with more collectors and fishing enthusiasts getting their own little piece of fishing history. After all, fishing tackle dates back centuries, so there are some incredibly valuable collectibles out there! There are even clubs and events for antique fishing tackle collectors and enthusiasts! The National Fishing Lure Collectors Club (NFLCC) and the Florida Antique Tackle Collectors (FACT), for example, are two popular non-profits celebrating antique collecting, while annual events such as the Antique Lure Show highlight how popular vintage tackle remains today. So, where does one start when it comes to collecting or using vintage fishing tackle? It depends on the angler really, not to mention your budget, as there are certainly some valuable items out there for sale. Let’s take a look. 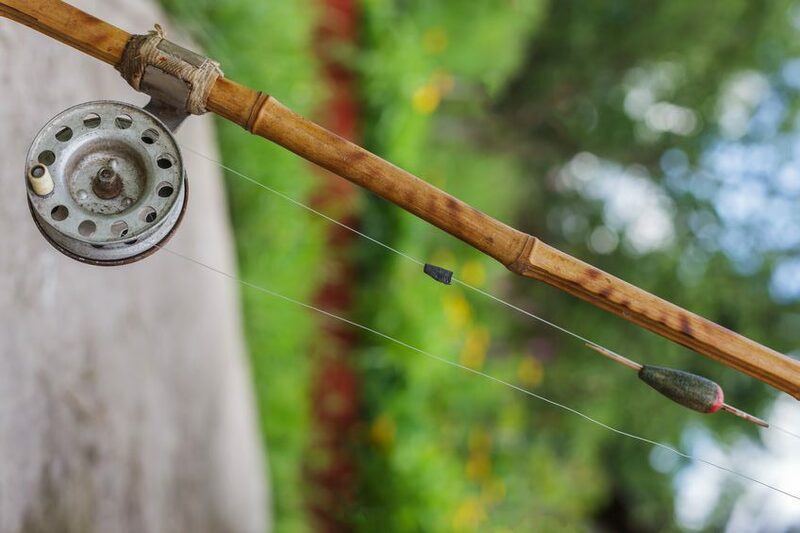 Now, for those of us old enough to remember, there was once a time when fishing rods had much simpler designs, with poles made entirely from wood, generally bamboo, not from modern high-tech materials such as fiberglass or high modulus carbon fiber. Different woods achieved different feels and weights, with split cane rods being the most popular – many still swear by them today! Hand-crafted, planed and varnished to the utmost perfection – cane rods were almost a work of art! But there’s more than monetary value to these old fishing rods. They aren’t all show! A split cane, or bamboo fly rod, for instance, offers exceptional casting, with a delicate yet accurate line/lure placement with the proper technique. After a hook-up, the entire rod comes to life, giving hints to the power and movement of the bite straight to the angler’s hands. It’s of little surprise cane rods are still popular today, with several tackle brands and independent craftsmen manufacturing modern equivalents, showcasing just how beloved this classic piece of tackle is. Better still, with some shrewd searching, you may find authentic cane rods dating back decades (or even centuries) on websites such as eBay or a local thrift store if you are lucky. A lot of care is required for cane rods as they are prone to warping and splitting, so they taught many anglers a valuable lesson on the importance of caring for your tackle – something we can all relate to even with modern equipment! When it comes to antique fishing tackle, there are fewer items more valuable than vintage lures. Designed to replace live bait, lures have an interesting history (likely dating back thousands of years), having first been made from bones and bronze. Of course, for most of us, coming across one of these vintage lures is very unlikely, unless you are visiting a museum! The second half of the 19th saw the first commercially manufactured lures made in the United States from wood and metal. The Heddon Company was known to be the first manufacturer of artificial wooden lures, making them from broomsticks in the Heddon family kitchen in Dowagiac, Michigan. 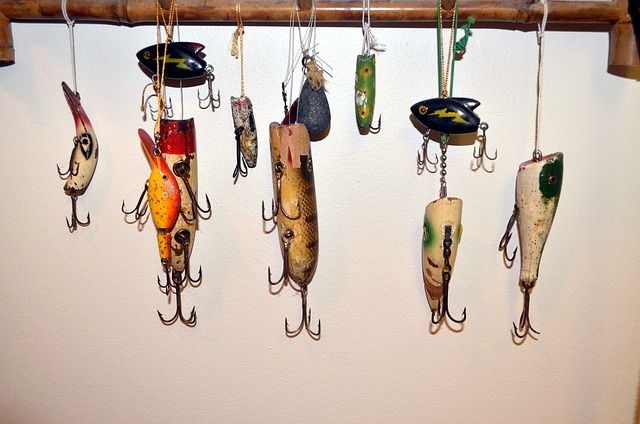 These old lures were decorated to resemble live bait, such as frogs and baitfish, and were usually quite effective. Heddon antique fishing lures such as these are incredibly valuable today, with prices regularly reaching several hundred dollars and more – they’ve become very collectible as a result. Many still swear by the effectiveness of them to this day, claiming the sounds produced by a wooden lure are more life-like than any modern lure! These older lures were usually painted in dull colors, which helped future anglers establish the effectiveness of colors in fishing. In doing so, future lures were designed with specific colors in mind, depending on what you were fishing. To think, all this stemmed from using classic wooden lures painted to resemble bait. 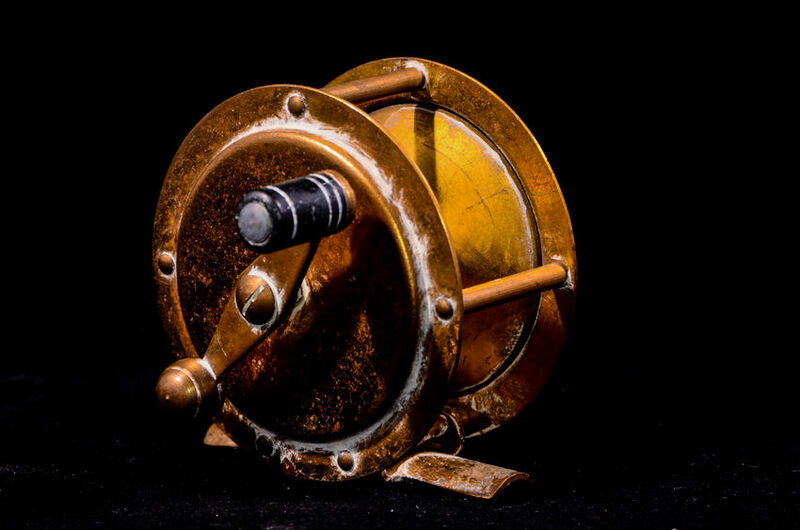 Modern fishing reels have come a long way from their vintage counterparts. It’s arguably the one piece of fishing tackle that has been unquestionably improved by technology, but there are many anglers out there that still love their vintage reels. Centre pin reels have somewhat of a cult following, for example. They are far from easy to learn, requiring a lot of time and effort to complete a drag-free drift. Yet many people still love to use them, as they force you back to basics, relying on skill and instinct to truly master. In fact, it could be argued that learning to use vintage reels such as a center pin reel forces you to become a better angler. Yes, there will be periods of frustration from over spins and the like, but they will only serve to improve your fishing ability – just ask your grandpa or father! The oldest vintage reels tend to date back to the 19th century. This is a period where fishing became much more specialized, leading to developments of reels and rods for specific types of sportfishing. Big-game reels, fly reels, spinning reels, and many more types would soon follow, and these are now some of the most valuable vintage fishing tackle available. Prices are quite high as a result, although it’s possible to find antique reels at yard sales, flea markets, and thrift stores. There are many other types of vintage tackle worth collecting – many of these accessories can still be used as part of your tackle today! Perhaps one of the most beloved accessories is the vintage tackle box. 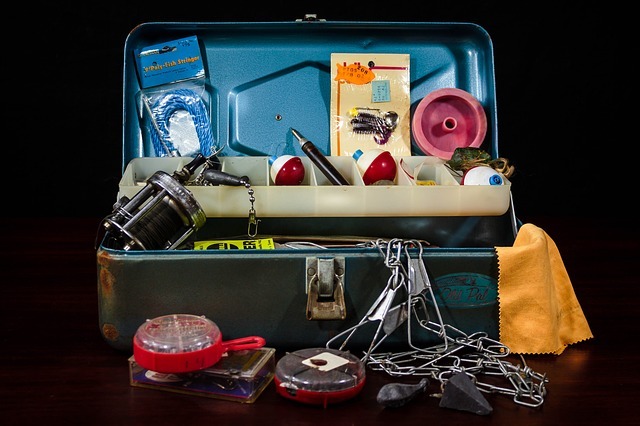 Any angler old enough will know the excitement of searching through an old metal box filled with lures, lines, knives, hooks and other fishing gear. Original tackle boxes were usually made from wood or metal, with most vintage boxes found today dating back to the early 20th century. Boxes were manufactured before this, but most anglers couldn’t afford enough tackle to warrant buying a tackle box, making 19th-century tackle boxes quite the rare collectible today. Plastic tackle boxes were developed around the 1930s, with manufacturers such as UMCO and PAL becoming the top producers of both plastic and metal tackle boxes, which hit peak popularity in post-war USA. In fact, tackle boxes from this era are often some of the most sought out among collectors, as imported tackle boxes from China, Japan, and Europe would soon flood the once American dominated market. Tackle boxes weren’t always specialized though, especially those made before 1960. By the 60s, bass fishing became so popular that manufacturers such as Plano started to make specially designed tackle boxes to accommodate the new craze. Today, the choices are almost endless, with tackle boxes for all types of fishing preferences and accommodations for our modern innovations and gadgetry. But there are times when I miss grandpa’s old-school metal box. Do you collect vintage tackle or perhaps still fish with them? Or maybe you just want to add to the conversation? Share your thoughts with us in the comment box below. This entry was posted in Fishing Tips & Other Wonderings, Recreational Fishing on May 2, 2018 by Dorado. Hey Warren. You have a little piece of angling history there! The iconic Ashaway Line & Twine Mfg. Co., founded in 1824 (and still in operation) in Rhode Island by commercial fisherman Captain Lester Crandall, is better known today for making racket strings – Racketball, tennis, badminton, squash, etc. – but back in the day, they were major producers of fishing line. Besides manufacturing linen fishing line, they also produced Dacron line, and in 1939 introduced the world’s first commercially available nylon fishing line. I’d hold on that spool! Older is better! I’m just now moving into “vintage only” and I’ve fallen in love with fishing all over again. The old excitement is back, and I can’t even describe it! If you’re not looking for perfect collectibles and just want to fish, you can find plenty of gear of all sorts. Give it a try. So true, Apache. I too love all things vintage and old fishing gear are right up there for me as far as interests. And you’re right, vintage tackle can certainly be fished if maintained. They are not restricted to collectors. I really enjoyed this blog post – it actually brought back a few memories of going fishing with my father and grandfather. It is amazing how things change and evolve over time. The bamboo fly rod looks very interesting. Hey John. I think both you and Peter have highlighted the importance of old gear in reconnecting us with the fishing’s past and fond memories. Appreciating and collecting vintage tackle is an area of sportfishing that doesn’t get the attention it should but is definitely growing. This reminds me of when I moved my elderly grandfather from Iowa to Pennsylvania to be close to my mother so she could care for him. He had been a lifelong fisherman and we were moving him into a small apartment. I was loading a uhaul trailer and when I got to his garage there sat all of his old fishing gear (this was 1972). Even though he knew he would never fish again he insisted that I load it all up to take with us. I don’t know what ever happened to it but I wish I had it all now. I love history, even when it’s about something I have little interest in. This was a fun look at how anglers’ equipment has evolved over the years. Give me the old school rod and reel anyday. They just look so cool!